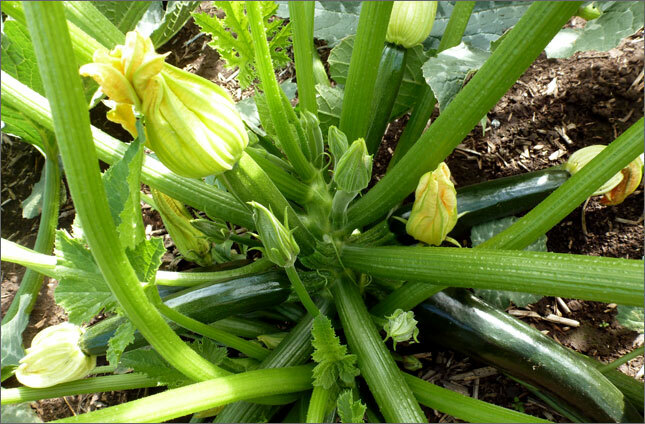 Born from disappointment with the availability and consistency of modern hybrid zucchini, and bred to be an open pollinated alternative for market gardeners, Dark Star is a success story of modern vegetable breeding. For the fascinating history, check out Dr. John Navazio's account, hosted on the Organic Seed Alliance's website. Dark Star is a vigorous producer of dark green skinned summer squash with creamy flesh and a high lutein content. We start our squash indoors in mid-May in small pots. Plant a few seeds 2.5 cm (1 in) deep in each pot and thin to the best one. Seedlings can be carried outside to get sunlight and brought in at night. Transplant out to the garden after risk of frost has passed, normally early June. The first fruits should be ready around the end of July. Harvest while under 20 cm (8 in) for best flavour. Good fresh, stir fried or grilled on the BBQ, Dark Star has a long harvest window and is more frost tolerant than other zucchini.